Jess McDonald scored in the 90th minute to lift the North Carolina Courage over the Orlando Pride 4-3 on a humid night at Orlando City Stadium in Orlando, Florida in front of 3,104 fans. The Courage improve to 8-0-2 on the season and the Pride are now 3-3-3 in league play. The two teams combined for seven goals, the most scored in an NWSL game this season. McDonald scored a brace in the win, and now has four goals on the year and 39 NWSL career goals. The game was the first meeting of the season between the Courage and Pride with the Courage playing in their second game in five days and the Pride fresh off a bye in Week 8 play. The Courage looked like they were going to get on the board early when midfielder Denise O’Sullivan played a through ball into forward Crystal Dunn. 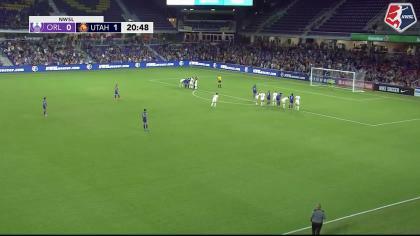 Dunn finished it off far post, but the goal was eventually ruled offside. The Courage were able to get one back, and several as the game went on. In the 31st minute, Courage defender Merritt Mathias found space down the flank and got a cross off. Her cross bounced out to Courage midfielder McCall Zerboni who got a shot off, but it was deflected off a Pride defender. O’Sullivan flicked the deflected ball on to McDonald who was on the far post and she was able to tap it in for the go-ahead goal in the 32nd minute. The Courage went into the half up 1-0, but then the Pride came knocking in the 52nd minute. Chioma Ubogagu scored her fourth goal of the season to tie the game up. Pride forward Marta crossed the ball and Ubogagu was crashing the near post and tapped it in to make it 1-1. Just five minutes later, the Courage grabbed back the lead, this time with a goal from forward Debinha. Courage defender Jalene Hinkle made the initial pass up the field that Debinha was able to fight the Pride defense for and strike it cleanly past Pride goalkeeper Ashlyn Harris for the 2-1 lead. Hinkle finished the game with an assist and six total crosses in 60 touches. Hinkle also leads the league in touches (784). The Courage extended their lead just minutes later with a Sam Mewis goal in the 62nd minute. Dunn played a service into the box and Mewis got her head on it for her second goal of the year. While Harris was able to get a hand on the header, the ball went over the line for the 3-1 lead. Then the Pride decided to keep things interesting at home, and pulled one back in the 65th minute thanks to an Alanna Kennedy header goal. Kennedy finished off of a corner kick from Christine Nairn. Nairn earned her third assist of the year on the play. The Pride were in stride, and made a key sub in the 75th minute in Rachel Hill. Hill entered the game, and just eight minutes later scored her second goal of the year. Marta earned her second assist of the night in the equalizer. The forward beat Mewis and Mathias down the left flank and crossed the ball into the box where Hill was crashing far post. Hill hit it one-time to even the scoreboard at 3-3. Neither side was going down without a fight, and in the 90th minute who other than McDonald to score the game-winner. Hinkle played a long service over the Pride’s defense that found McDonald crashing the net. McDonald put it away to score her second goal of the night and give the Courage their eighth win of the season. McDonald, in addition to four goals this season is also tied for first in the league with assists (3). She finished the game with a team-high seven shots with four on target. The possession was close on the night with the Courage holding a slightly higher advantage at 51.3% to the Pride’s 48.7%. The Courage had 26 shots off with nine on target and the Pride had seven shots off with three on frame. The passing accuracy was also neck-in-neck with the Courage at 70.2% and the Pride at 69.5%. The Pride will be back in action on Saturday when they visit Toyota Park to play the Chicago Red Stars and the Courage will look to stay undefeated on the year when they visit Providence Park to face the Thorns next week on Wednesday, May 30. 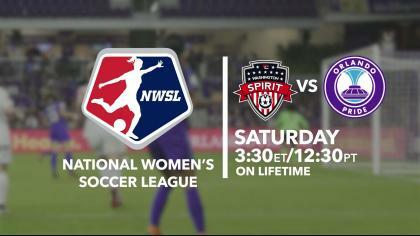 Match ends, Orlando Pride 3, North Carolina Courage 4. Second Half ends, Orlando Pride 3, North Carolina Courage 4. Goal! Orlando Pride 3, North Carolina Courage 4. Jessica McDonald (North Carolina Courage) header from the centre of the box to the bottom left corner. Assisted by Jaelene Hinkle. Attempt saved. Meredith Speck (North Carolina Courage) header from the centre of the box is saved in the centre of the goal. Assisted by Merritt Mathias. Attempt missed. Marta (Orlando Pride) left footed shot from outside the box misses to the right. Assisted by Dani Weatherholt. Goal! Orlando Pride 3, North Carolina Courage 3. Rachel Hill (Orlando Pride) right footed shot from very close range to the bottom right corner. Assisted by Marta with a cross. Substitution, Orlando Pride. Poliana replaces Carson Pickett. Corner, North Carolina Courage. Conceded by Ali Krieger. Attempt blocked. Crystal Dunn (North Carolina Courage) left footed shot from a difficult angle on the right is blocked. Assisted by Jessica McDonald with a headed pass. Corner, North Carolina Courage. Conceded by Carson Pickett. Attempt blocked. Crystal Dunn (North Carolina Courage) left footed shot from the centre of the box is blocked. Assisted by Jessica McDonald with a headed pass. Emily van Egmond (Orlando Pride) is shown the yellow card for a bad foul. Crystal Dunn (North Carolina Courage) wins a free kick on the right wing. Goal! Orlando Pride 2, North Carolina Courage 3. Alanna Kennedy (Orlando Pride) header from the centre of the box to the top right corner. Assisted by Christine Nairn with a cross following a corner. Corner, Orlando Pride. Conceded by Samantha Mewis. Corner, Orlando Pride. Conceded by Abby Dahlkemper. Goal! Orlando Pride 1, North Carolina Courage 3. Samantha Mewis (North Carolina Courage) header from the centre of the box to the bottom right corner. Assisted by Crystal Dunn with a cross. Corner, North Carolina Courage. Conceded by Chioma Ubogagu. Attempt missed. Alex Morgan (Orlando Pride) header from the centre of the box misses to the right. Assisted by Carson Pickett. Goal! Orlando Pride 1, North Carolina Courage 2. Debinha (North Carolina Courage) right footed shot from the centre of the box to the bottom right corner. Goal! Orlando Pride 1, North Carolina Courage 1. Chioma Ubogagu (Orlando Pride) left footed shot from the left side of the six yard box to the bottom left corner. Assisted by Marta. Second Half begins Orlando Pride 0, North Carolina Courage 1. First Half ends, Orlando Pride 0, North Carolina Courage 1. Offside, North Carolina Courage. Debinha tries a through ball, but Crystal Dunn is caught offside. Attempt missed. Merritt Mathias (North Carolina Courage) right footed shot from the centre of the box is high and wide to the right. Assisted by Debinha. Attempt blocked. Denise O'Sullivan (North Carolina Courage) right footed shot from outside the box is blocked. Assisted by McCall Zerboni. Corner, North Carolina Courage. Conceded by Kristen Edmonds. Attempt missed. Jessica McDonald (North Carolina Courage) header from the centre of the box misses to the left. Goal! Orlando Pride 0, North Carolina Courage 1. Jessica McDonald (North Carolina Courage) right footed shot from the centre of the box to the bottom right corner. Assisted by Denise O'Sullivan. Attempt blocked. McCall Zerboni (North Carolina Courage) right footed shot from the centre of the box is blocked. Attempt missed. Alanna Kennedy (Orlando Pride) header from the right side of the six yard box is high and wide to the right. Assisted by Carson Pickett following a set piece situation. Attempt saved. 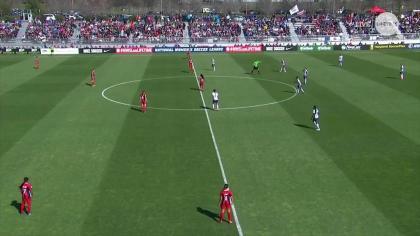 Crystal Dunn (North Carolina Courage) right footed shot from the centre of the box is saved in the centre of the goal. Assisted by Jessica McDonald. Attempt missed. Chioma Ubogagu (Orlando Pride) left footed shot from the left side of the box misses to the left. Assisted by Ali Krieger. Attempt missed. Crystal Dunn (North Carolina Courage) right footed shot from the centre of the box misses to the left. Assisted by Samantha Mewis with a through ball. Attempt blocked. Jessica McDonald (North Carolina Courage) right footed shot from the centre of the box is blocked. Assisted by Debinha. Attempt missed. Crystal Dunn (North Carolina Courage) right footed shot from outside the box misses to the right. Assisted by Abby Dahlkemper with a cross following a corner. Attempt blocked. Debinha (North Carolina Courage) right footed shot from outside the box is blocked. Assisted by Denise O'Sullivan. Attempt missed. Jessica McDonald (North Carolina Courage) left footed shot from very close range is close, but misses to the left. Attempt saved. Jessica McDonald (North Carolina Courage) header from the centre of the box is saved in the bottom left corner. Assisted by Abby Dahlkemper. Crystal Dunn (North Carolina Courage) hits the right post with a right footed shot from the left side of the box. Attempt missed. Abby Erceg (North Carolina Courage) header from the left side of the box misses to the left. Assisted by Abby Dahlkemper with a cross following a corner. Corner, North Carolina Courage. Conceded by Alex Morgan.